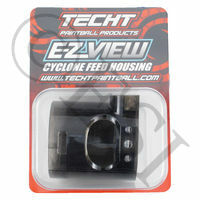 The TechT Vortex Mod is hard-coated and teflon coated aluminum internals. While other manufatures cyclone internals need to be replaced on a regular basis, the TechT Vortex Mod is a permanent solution that makes the cyclone into the fastest, and most reliable loader available. Testing has shown that the Vortex Mod will allow the Cyclone feed to work at lower pressures, feed faster, and last longer than the stock internals. 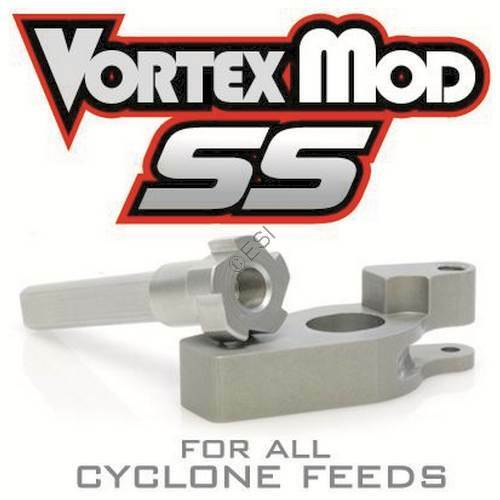 From Techt May 2006: The Vortex Mod is for those looking to have the fastest and most reliable cyclone feed available. 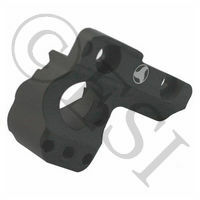 Initially we were looking to make parts that were just more durable than the stock plastic internals. However, through our testing we started to realize that we could, and should, actually make higher performing parts. The result was awesome!!! We found that we were able to make the cyclone loader work at lower pressures. During testing we ran the A5 until we ran out of air. The result was that the loader continued to load balls all the way down to 100-150 psi. At that point the gun stopped re-cocking. 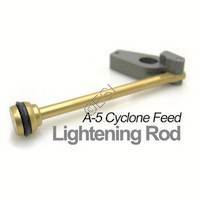 Understand that results will vary a bit based on the condition of your cyclones internal oring, and how well its lubrcated. But know that it will feed at lower pressures. Typically the stock parts stop loading balls at about 350-400 lbs. That's enough pressure to still shoot about 200fps, but you are forced to manually feed each ball by hand. With the Vortex Mod, you're cyclone will keep you in the game longer. It makes sense that if the parts make it so the loader takes less air to work, that they also could make the loader work faster. 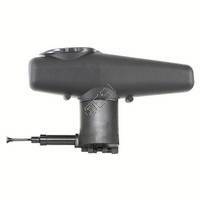 We tested one of the new Tippmann 98 Pro-E with ACT (anti-chop technology) with a standard Halo, Empire Reloader B, Standard Cyclone, and a Cyclone feed with a Vortex Mod. We doubted that any loader would keep up to 25 BPS, but because the gun had the ACT "jam bolt" we knew it was safe to out shoot the loader without having to worry about chopping paint. 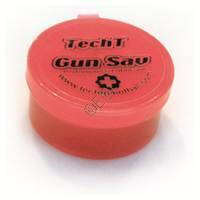 After shooting about 500 rounds through the gun with each hopper the results were conclusive. The standard halo would feed 4-5 shots, and then stop loading. The Empire Reloader B fed about 7-10 shots and then stopped loading. The Standard Cyclone fed about 10-15 shots and then stop loading, and the Vortex Mod would shoot nice long streams of paint and only a skip a couple balls. Overall we were very happy to see how well the Vortex Mod performed. We are working on getting some video footage up that will show these results, but for now know that the Vortex Mod makes the Cyclone feed faster. 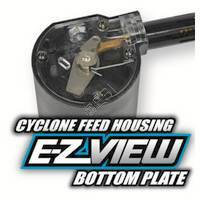 So, if you are sick of buying replacement internals for your Cyclone Feed, and you want the most durable, efficient, and fastest parts available, these little beauties are for you. 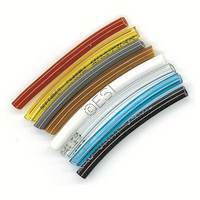 These parts are made of anodized aluminum and come with a 1 year warranty. To date we have not had a single Vortex Mod wear out. 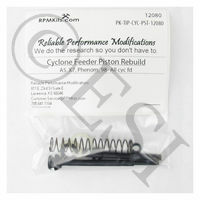 Kit includes all pins and screws you will need, however you will need the stock springs for the ratchet. 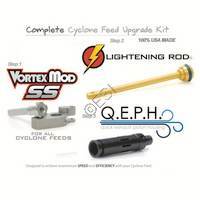 Since its release, the Vortex Mod has been the most widely used, and most trusted name in cyclone upgrades. The Vortex Mod SS is specifically designed to be the fastest, smoothest actuating, and most durable/long lasting upgrade available. And did we mention it was easy to install? 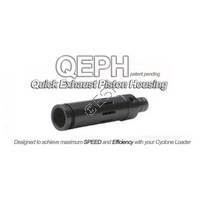 The "Genuine" Vortex Mod was by far the most durable and highest performing cyclone upgrade available. 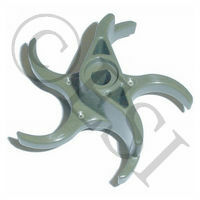 In the past we said that if our Vortex Mod wasn't the best Cyclone Ratchet Upgrade in the world that we would redesign it to crush the competition, and that's exactly what we did. 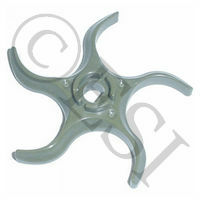 With a new stainless steel axle and design refinements it is now far and away the "best of the best". 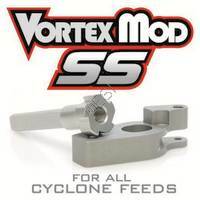 The Vortex Mod SS will feed upwards to 30+ balls per second and continue to load down to pressures as low as 150psi.